I have seen a lot of great posts on using Google to find your ancestors. But today I wanted to highlight a Google technique I use that continually brings great results. For many of my ancestors I know the "basic" facts that you would find by Googling their names. Actually, Google searches by name often lead me right back to my own blog or message posts. So I now search for items specific to that individual. I have found that when I search for an organization, a job, or a military unit, I find hidden gems that I would have never found if I had just searched for the individual. The key is that I will often come across PDF files or books about the organization, business, or unit that include specific information about my relative. Because these files are not always in a "searchable" format I would never have been able to find them through a simple name search. Case in point: Not long ago I was working to find more information on a distant uncle, Leroy Philip Kuhn. Through a biography I had found on Dr. Kuhn, I knew that he was a prominent surgeon in the Chicago area specializing in work injuries. 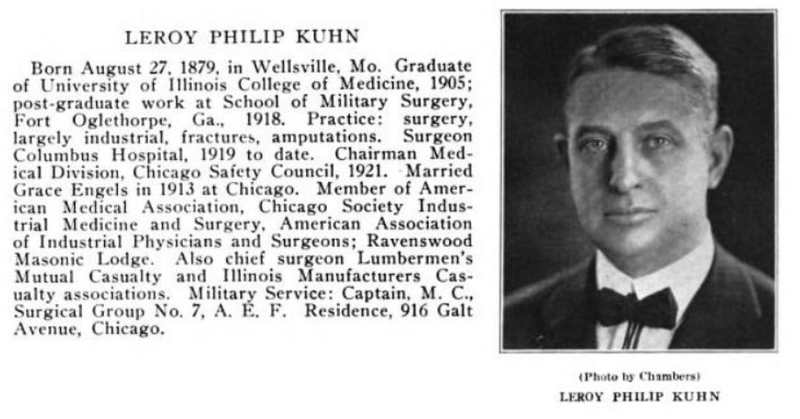 To find more I did a Google search for "Kuhn Chicago surgeon" and found the gem above. I had never seen this uncle before and was amazed at the family resemblance. I have found this search technique especially helpful with finding information on my military ancestors. My uncle Warren Edward Kuhn was killed during WWII and my father was named after him. I knew that Warren was in the 814th Tank Destroyer Battalion which was assigned to the 7th Armored Division. Warren was killed in action March 17, 1945. When I do a Google Search for "Warren Kuhn 1945" I only find unrelated links and my own blog posts. But conducting a search for "814th Tank Destroyer Battalion" led me to more information about his unit which helped me to put his war service in context. I found a link to an After Action Report for the 814th TD BN which detailed the unit's actions in December 1944...which is the month when my uncle earned a Bronze Star medal. Now I know, from the unit perspective, how he earned his medal. I was also able to find additional information on the civil war service of my 3rd Great grandfather, Marcellus White, by searching for information on his unit the Salem Flying Artillery. Have you had luck with this type of search technique? Great idea! And I agree that after you post enough, Google leads back to yourself. Not helpful lol! As a matter of fact, I have done this but had never thought analytically about it from a "research strategy" standpoint. My dad was in the Coast Guard in the late 1940s, and while I have his scrapbook and his discharge papers, I don't really know that much about his work then. I Googled the names of his various ships and found one that has somewhat of an alumni-type website covering the history of the ship and anything about anyone who ever served. Some of the pictures and stories are similar to those in my dad's scrapbook, so finding this site really filled in the gaps for me. Thanks for sharing this search tip, Heather. I think I've partially used it when I searched for my g-g-grandfather's C.W. unit. I didn't find anything particular to him but learned more about the unit's activities, which I appreciated knowing. But I hadn't transferred the thought to businesses, organizations, etc. Now I have another way to search. Thanks! And thanks for the image with the list. I pinned it along with a link back to this post. Great tips! I've also searched for the address that a family lived at (found from a city directory), searched for the hospital a physician worked at, and searched for the medical association they joined. Amy Coffin the author of We Tree posted a very recent blog suggesting that genealogy researchers take Google's free Power Searching and Advanced Power Searching course. I just started the Power Searching course and am finding it wonderful! The videos in the first class are about five minutes, short enough to retain each excellent tidbit of new knowledge about searching. Thanks, Nancy! I have found this technique especially helpful when searching for clubs/organizations. Good luck! That's a great tip, Joanne. I'm definitely going to try that out! Wendy, that's great news! I have found that military members are still passionate after they leave/retire from the service. Their alumni associations typically have great websites with lots of information. Thanks for the tip! Great ideas I can use! Never thought of it, for some reason! Thanks for posting this. Going to try it right away. Thanks, Bettyann! You'll have to let me know if you have any luck!